I have lived in Mumbai for almost eight years. But ever since I became a wheelchair user I have dreaded the thought of going on the city roads. Traveling in public transport such as the iconic local trains and classic-red-BEST buses is unimaginable because of the superfluous crowd and inaccessibility. However, the city seems to have taken the lead in providing the maximum number of taxi services that are accessible for wheelchair users. 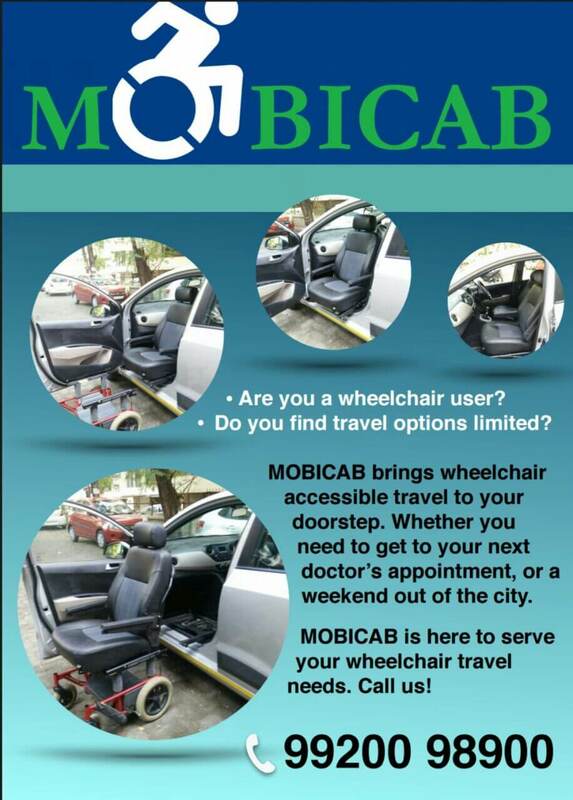 Check out these wheelchair accessible taxi services from Mumbai. You can either use them to take a spin around the city or hire them to travel throughout the country. Ezy Mov has a fleet of 10 accessible taxis, modified Tata Venture and Tata Winger. They had earlier partnered with Meru and launched Meru Enable, but are now working independently. They have an all India permit, so if you want to go out of Mumbai to any other city in the country, you can hire their taxi. There are also available on a weekly and monthly basis. Costs: Base fare of Rs 212 for first 4 km, thereafter it’s Rs 33 per km. Hire the taxi for a day i.e. 8 hrs, 80 kms for Rs 3000. Check out my video for a closer feel of the taxi. I had tried their wheelchair accessible taxi when it was called Meru Enable. Their service quality remains the same. Available since 2006, Samartha Travels is undoubtedly one of the first wheelchair accessible taxi services available in the country. They started with a modified Toyota Qualis. Today their fleet consists of 2 vans; a Tata Winger with a hydraulic lift and another Tata Winger with a foldable ramp made of lightweight aluminum. In addition to the driver and the wheelchair user, 4 additional people can travel in the vans. Cost: Hire the taxi for a day i.e. 8 hrs, 80 kms for Rs 3500. Thereafter it’s Rs 20 per extra km/ Rs 200 per extra hour. For outstation travel, it’s Rs 25 per km + driver allowance of Rs 1200 per day. Started by Arvind R. Prabhoo, who is a quadriplegic, Access 4All has been operational since 2008. Their fleet consists of 2 Tata Winger vans equipped with hydraulic lifts. Their taxi can accommodate up to 2 wheelchair users and has additional seats for 3 regular passengers. Cost: Hire the taxi for a day i.e. 8 hrs, 80 kms for Rs 1800. Thereafter it’s Rs 25 per extra km/ Rs 250 per extra hour. Pickup and drop from anywhere in the city to the domestic airport is Rs 1500 and for the international airport is Rs 2000. Mobicab was started by Sanjana Aswani. Their fleet consists of 2 cars and more will be added in the future. The Hyundai Accent taxi has a front seat that swivels out and can be attached to an undercarriage. This converts the car seat into a wheelchair which can be taken around. The other taxi is a Tata Winger and it has a foldable ramp. Cost: Hire the taxi for a day i.e. 8 hrs, 80 kms for Rs 3000 and for 4 hrs, 40 kms its Rs 2200. Website: Their service is new and website is not yet launched. You can check out their pamplet here. I hope you found the above information useful. If you come across any other wheelchair accessible taxi service in Mumbai, then do share their details in the comments section below. I will be happy to update the blog. Very good Mrunmaiy, I sincerely appreciate your efforts to find accessuble vehicles and collect and share the information for other disabled people…I was aware of all these companies and apart from these companies I have no knowledge of any other company that is running such a service. Their accessible taxis are usually the big ones, pretty stable. They also fasten the wheelchair with four locks. Go right ahead. I’m sure you will enjoy the ride. You can always ask the driver to go super slow if you’re feeling uncomfortable.